I have owned various stand up outdoor machines. These have varied from those that resemble stepping machines (Street Stepper, Me Mover and a Stride Core) to those that attempt to mimic a running motion (Bionic Runner, Elliptigo and Cyclete). The latest machine I have been using is the Cyclete, which I have been using for the last month. I therefore thought it might be beneficial to some people to do a comparison of the 3 outdoor machines that resemble a running motion. I will compare the overall build, the gearing, stride and intensity of each machine. BUILD. Starting with the overall quality of the frame and components I believe the Cyclete stands alone in its quality. The frame just oozes quality it is so sturdy you feel safe on any form of terrain and surface including off the road. The thought that has gone into designing the machine is obvious with lips on the inner and front of the pedal to ensure your foot stays in the correct position throughout the pedal action. Additionally the wheels are 29 inches compared to the 20 inch wheels on the Bionic Runner and Elliptigo. This means steering the Cyclete is safer and the tyres absorb the impact better. 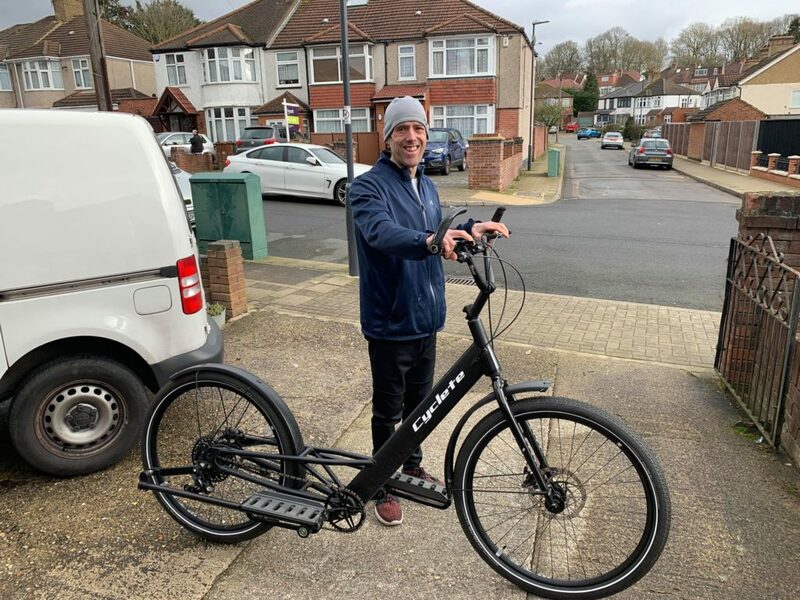 I suffered a number of falls on both the runner and elliptigo when riding on wet surfaces where the large distance between the handlebars the wheels meant steering was not as “sensitive”. The last of these falls resulted in a fractured cheekbone and eye socket! The problems I found with both the Bionic Runner and Elliptigo related to their folding mechanisms. Over time I found both had a give where the handlebars folded down that meant they did not feel as secure when handling and turning. Finally the rear fork end on the Elliptigo was vertical as opposed to horizontal. Over time the chain would become loose and would regularly slip off when cycling. GEARING. Both the Elliptigo and Bionic Runner had internal gear hubs which worked perfectly well. I also found the range more than adequate to climb steep hills and gain some speed on the flat. The Cyclete has the SRAM gears the range of which is enormous. Climbing any hill is no problem and you can maintain tension on the chain when cycling downhill. Changing gears on all machines was smooth irrespective if you were applying pressure to the pedals at the time. STRIDE: The Elliptigo stride resembles an elliptical motion which feels like an up and down pattern as opposed to actual running. The Bionic Runner utilises a 40/60 ratio between the power stroke and recovery stroke. The motion also resembled running in terms of a kick back of the “swinging” leg. The cyclete employs a tear drop motion which is extremely smooth and also means you experience a kick back of the swinging leg. Additionally you do not extend the foot excessively in front of the body when applying downward force on the pedal. This is relevant in terms of the transition to running where over-striding might be problematic. INTENSITY. The fact you were only applying force through the pedal for 40% of the cycle meant the bionic runner could provide a very intense interval workout, probably more so than the Elliptigo or Cyclete. However for longer rides the Cyclete would be my preferred choice purely because it is so comfortable to cycle on and you feel so safe on it. CONCLUSIONS. The frame build and attention to detail of the Cyclete means it stands alone in terms of quality. The gears on all 3 machines are fine in terms of the range they provide and ease of how they change. The stride of the Cyclete is very smooth and close to a running stride, same as the Bionic Runner. The Elliptigo probably isn’t as smooth and in my opinion feels more like an up and down motion. If doing interval intense training I would go for a Bionic Runner, however for endurance rides the Cyclete would be my choice from a comfort and safety perspective. Finally the service you get from the owner of Cyclete is quite remarkable. He assembles the machine himself and is always available to offer advice regarding the optimal set up for your needs. This is irrespective of the time difference between USA and GB. He is keen to receive feedback and be made aware of any problems you might experience so they can be sorted. This level of service is very rare when the bikes become mass produced as with the Elliptigo and Bionic Runner. NB the Bionic Runner company no longer trade and therefore you will need to purchase a used one from the net. My Cyclete was fitted with a 42T chain ring which is larger than standard and I had Schwalbe Almotion tyres fitted.